Come the weekend and a relatively quiet Fitzroy Street is transformed into a hive of activity, showcasing the creative side of everyday Melburnians. 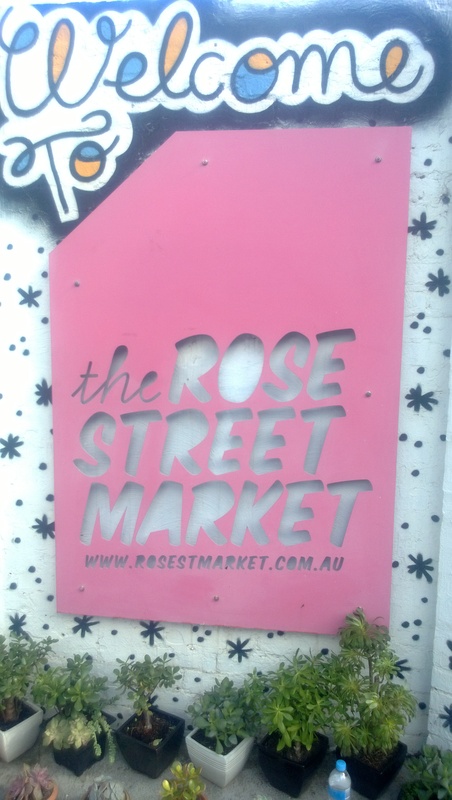 4 reasons we love the Rose Street markets? One: It’s quality over quantity approach, achieved by using an application system that judges the worthiness of a potential stall based on “quality of work, perceived potential and uniqueness of work”. Two: Come her, and you will never go to a newsagency to purchase a greeting card again. The range of quality handmade cards designed by locals is a highlight. Three: This doubles as a great art gallery. Craft, photography, painting, sculpture, all at gallery standards. Better yet, should you admire the artwork, you can take it home at a reasonable price. There are multiple cafes located on Rose Street. Perhaps the best of them is Industry Beans (providing you can handle the guilt of eating brunch while overlooking a cross fit studio). The menu is seasonal and full of interesting and unique breakfast flavours and the coffee roasted on site. Other options in the area include the homely Grace and the markets very own Young Bloods Diner. Welcome to My City Melbourne - a tourist guide for locals. The site contains some simple ideas and suggestions for enjoying Melbourne, all written from the perspective of someone local.